Synopsis: Several years after the tragic death of their little girl, a dollmaker and his wife welcome a nun and several girls from a shuttered orphanage into their home, soon becoming the target of the dollmaker's possessed creation, Annabelle. Annabelle Creation hit a home run with both critics and audiences and I think this was a good way for me to head into Annabelle and the rest of the series. I'll definitely be checking out Annabelle. If it's anything like this, I'm sure I'll be very happy. Synopsis: "Former Gotham City District Attorney Harvey Dent, one side of his face scarred by acid, goes on a crime spree based on the number '2'. All of his actions are decided by the flip of a defaced, two-headed silver dollar." Adam West sadly passed away earlier this year but before he left us, he recorded one last performance as Batman, the role that brought him the most notoriety. 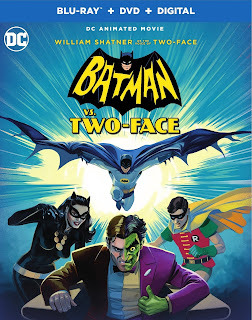 Also joined by Burt Ward, Julie Newmar and after much anticipation, William Shatner in his role of the evil TwoFace! I always heard the rumor that Clint Eastwood was considered for TwoFace but was abandoned after the script originally written was just too violent for the tone of the show. However, Shatner stepped into an otherwise untouched role in this particular universe and nailed it. Two-Face hasn't been explored as much in the DC Animated universe and I hope that changes. Always liked him as a character and thought the possibilities for more stories. 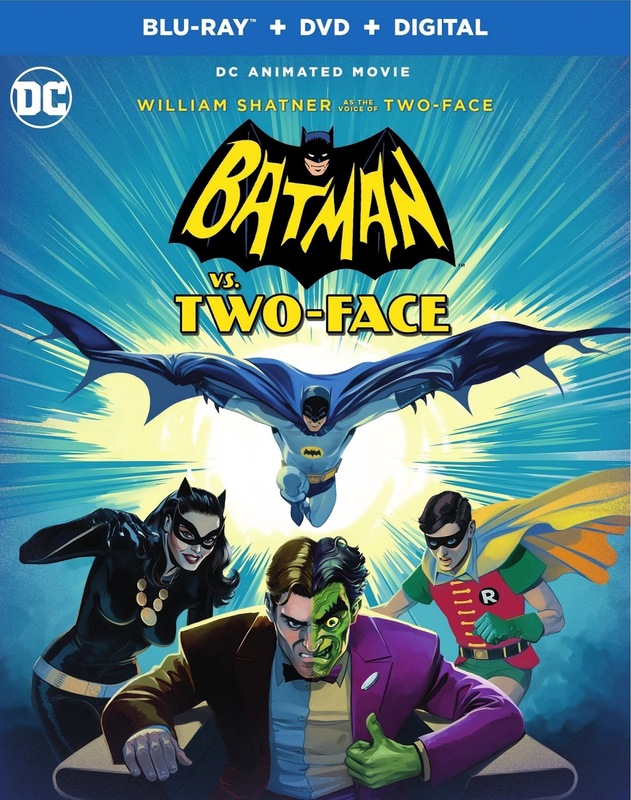 I know it's more inline with Batman mythology to move on to another villain in further installments, but I hope Shatner's TwoFace is considered for more sequels. What we received was a delightful tribute to the 1960's series. A lot of fun gags, great voice acting and of course, amazing animation by Warner Brothers, and of course a hint at who will be the next villain...or is that...villainess, puddin'?